Thousands of street cats live in Istanbul, the largest city in Turkey, as they have for centuries. Some are wild and fend for themselves, while others are tamer and are cared for by people. 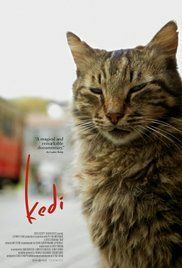 Kedi depicts these cats, and includes many interviews of the people who interact with them. It focuses on seven of the cats, who are named Sari, Duman, Bengü, Aslan Parçasi, Gamsiz, Psikopat, and Deniz. Read more on Wikipedia.